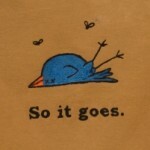 This topic contains 11 replies, has 3 voices, and was last updated by cybele727 1 year ago. This is my first ever boy’s button down shirt. I am taking it slow so that fatigue doesn’t cause mistakes. But I am at the stage where you pin the collar band on the shirt and have a question. My band seems way too long. 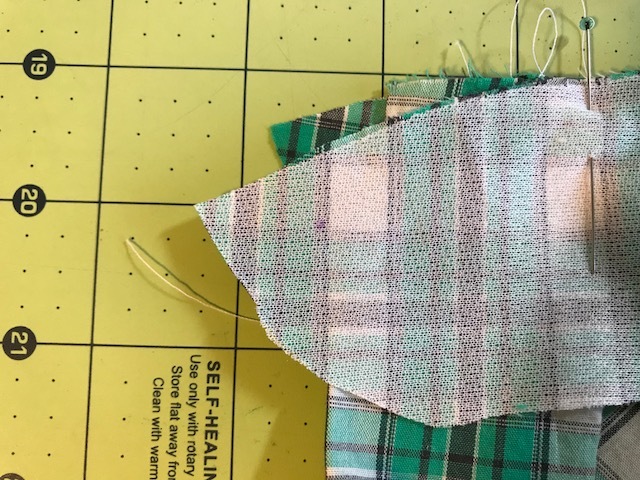 When you place the band and align the dots with the folded edge of the button placket, there should be 1/2 inch excess at each end from dot to edge of band fabric. Then you should ease the collar band between all the matching notches, seams etc. However, I feel like I have a lot to ease. Basically I have an entire 1/2 inch to ease which would require a TON of clipping against the neck curve to get it all in. The instructions say clip as little as you can. I need to clip a ton to accommodate the curve and extra ease on the band. It feels like too much extra. When I just pinned the collar at the dot-folded button placket edge and laid it out without matching center, etc, the band lays perfectly against the neck edge but the collar extends a full 1 inch past the folded button placket edge (and therefore 1/2 inch past the correct ending point). Is there supposed to be that much ease, clipping for the curve, etc? Can you tell me what size you’re making? It’s late here, but I can double-check it in the morning. In the meantime, make sure you’re pinning on the seamline and not on the cut line. The smaller sizes will require more clipping than the larger sizes, but if you need to clip don’t hold back. Some fabrics require more clipping than others. I hope that helps! I am aligning rough the cut edges of the neckline and the collar band right? I will see if I can take a small file picture to upload. Although I’ve never had any luck uploading pictures to the forum. I don’t have the pattern to hand, but is there any chance you’re trying to attach the collar band upside down? Ha! The first thing I did was say- did I pin the wrong side. Note I have sandwiched the shirt between the collar band and the rough edges of the band and shirt are aligned. I’m having a hard time understanding what you mean by by pin at the seamline. Ugh. I need to figure out how to decrease my photo size. Grrr. Lol. This is a picture of the end where if I pin at one end and align raw edges it shows the extra. In the pic above the green is 1/2 inch of neckline. The collar band is aligned and pinned to the basting line (where interfacing starts). The last picture is a wrong way go back 🙂 don’t do that. The raw edges should be aligned. Raw edge of collar band facing, shirt, then collar band. The dots (1/2″ in from ends) should align with the edges of the finished plackets. Pin those ends first. Then pin the centre notches, then side notches then keep bisecting each section with pins until it’s all eased in. 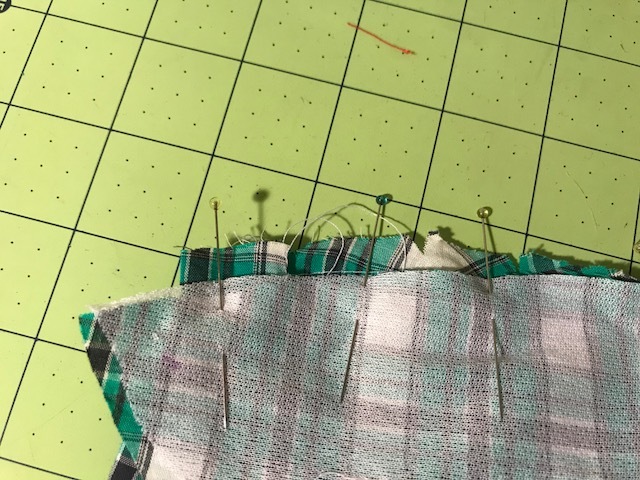 Have the pins holding the fabric together at the 1/2″ in from raw edge line. That’s what’s meant by pinning on the stitching line. If it still seems like it cannot possibly fit without big puckers then you might need to go back over your tracing and cutting in case you’ve ended up with the wrong size collar. I guess I just have a lot of ease. I will try it. The thing about doing a new thing… you aren’t sure you’ve done it correctly until it turns out or doesn’t and it’s “too late.” HA! But once you have the experience to say… yes this ease is ok… then you move along as if no big deal.